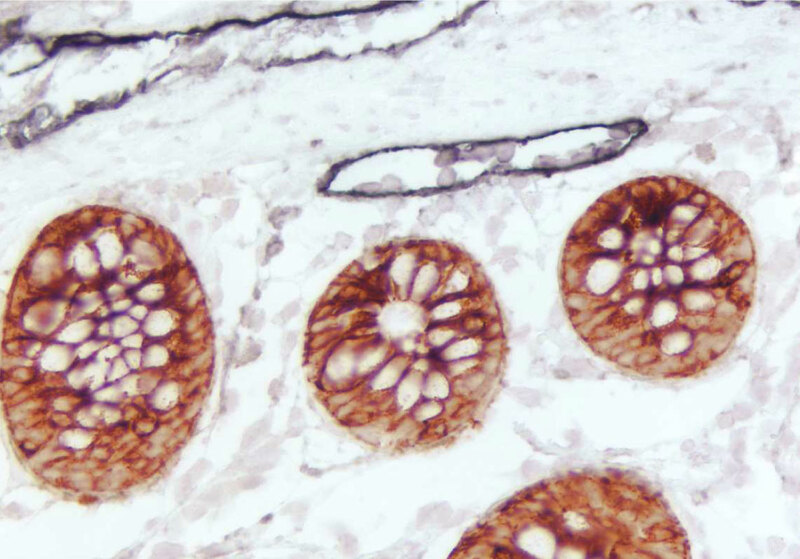 The preferred method for double or triple labeling involves sequential staining of each primary antibody. 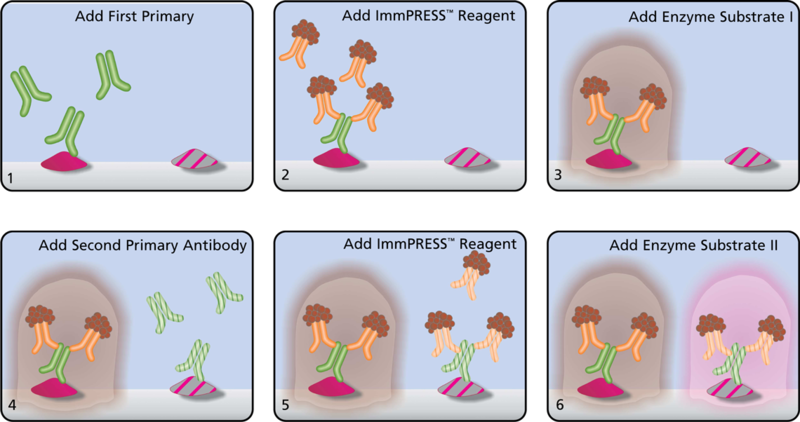 With proper color development of substrate, the reaction product from the first substrate usually prevents most of the subsequent antibodies and detection reagent(s) from interacting with components used to stain the first antigen. 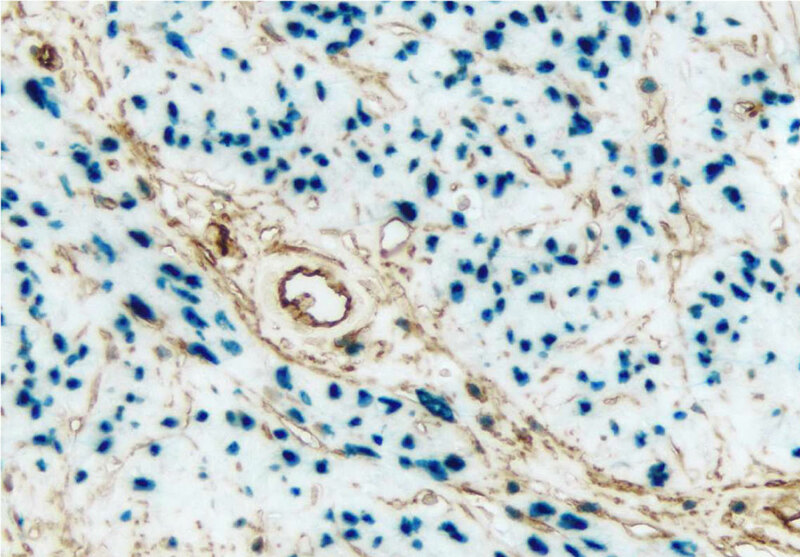 This feature allows multiple labeling with primary antibodies raised in the same species using a single VECTASTAIN® ABC kit or ImmPRESS™ reagent. The order of the primary antibodies and the substrates is very important. Several controls and additional blocking steps may be necessary to obtain optimal results. Numerous combinations of colors are possible using Vector Laboratories’ products and our multiple labeling protocols. • M2A Antigen (m), ImmPRESS™ Universal Reagent, DAB+Ni HRP substrate (gray/black). • Progesterone Receptor (rm), VECTASTAIN® Universal ABCAP Kit, Vector® Blue AP substrate (blue). Preparation of tissue. Deparaffinize and rehydrate tissue sections following standard protocols. Rinse in distilled water for 5 minutes. If endogenous enzyme activities are present inactivate using appropriate methods (See Appendix 2). Wash sections 2 x 3 minutes in 10 mM sodium phosphate buffer, pH 7.5, 150 mM NaCI (PBS). (Other buffers may be used). Avidin/biotin blocking step. Perform Avidin/Biotin blocking if required (Avidin/Biotin Blocking Kit, Cat. No. SP-2001). Incubate sections with Avidin Solution for 15 minutes. Rinse briefly with buffer, then incubate in the Biotin Solution for 15 minutes. Wash sections 2 x 2 minutes in buffer. This blocking step may be eliminated if suitable controls have determined such background not to be a concern. Protein blocking step. Incubate sections for 20 minutes with buffer containing 5% normal serum (NS) prepared from the first VECTASTAIN® kit, or incubate for 5-10 minutes in 10% NS. Primary antibody. Blot excess blocking solution from sections and incubate with the first primary antibody diluted in 5% NS from the first VECTASTAIN® kit using appropriate concentration and length of incubation. Wash 2 x 3 minutes in buffer. Secondary antibody. Incubate sections for 30 minutes with biotinylated secondary antibody from the first VECTASTAIN® kit diluted in 5% NS. For a 5-10 minute incubation, double the concentration of the biotinylated antibody and normal serum. Wash sections 2 x 3 minutes in buffer. ABC. Incubate sections for 30 minutes with the first VECTASTAIN® ABC reagent prepared in advance as described in the kit instructions. For a 5-10 minute incubation, use the VECTASTAIN® ABC reagent at twice the recommended concentration. Substrate. Incubate sections with the appropriate enzyme substrate until optimal color develops. Use the recommended times given in the substrate kit instructions as a guideline. Protein blocking step. Incubate sections for 20 minutes with buffer containing 5% NS prepared from the second VECTASTAIN® kit, or incubate for 5-10 minutes in 10% NS. Primary antibody. Blot excess blocking solution from sections and incubate with the second primary antibody diluted in 5% NS from the second VECTASTAIN® kit using appropriate concentration and length of incubation. Secondary antibody. Incubate sections for 30 minutes with biotinylated secondary antibody appropriate for labeling the second primary antibody diluted in 5% NS. For a 5-10 minute incubation, double the concentration of the biotinylated antibody and normal serum. ABC. Incubate sections for 30 minutes with the second VECTASTAIN® ABC reagent prepared in advance as described in the kit instructions. 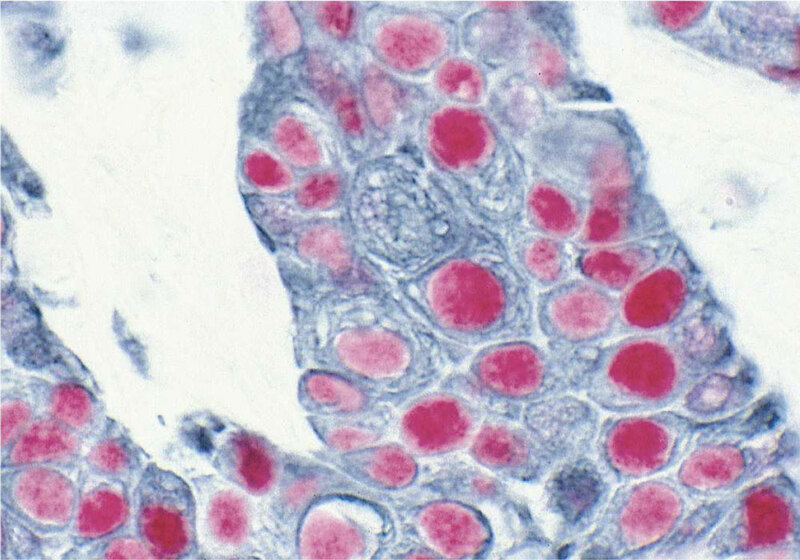 For a 5-10 minute incubation, use the second VECTASTAIN® ABC reagent at twice the recommended concentration. Substrate. Incubate sections with the appropriate second, contrasting enzyme substrate until optimal color develops. Use the recommended times given in the substrate kit instructions as a guideline. Wash sections in tap water for 5 minutes. Counterstain, clear, and mount in appropriate mounting medium. If endogenous peroxidase activity is present in the section, inactivate using an appropriate method (See Appendix 2). Protein blocking step. Incubate sections for 20 minutes with ready-to-use (2.5%) normal horse serum (NHS). Primary antibody. Incubate sections with mouse or rabbit primary antibody diluted in appropriate antibody diluent (buffer containing diluted (2.5%) NHS or 0.1% immunohistochemical grade bovine serum albumin (BSA)). ImmPRESS™ Reagent. Incubate sections for 30 minutes with appropriate ImmPRESS™ Reagent (anti-mouse Ig, anti-rabbit Ig, or universal). 1Substrate. Incubate sections in peroxidase substrate solution until optimal color develops. Rinse for 5 minutes in buffer. Protein blocking step. Incubate sections for 20 minutes with ready-to-use NHS. Primary antibody. Incubate sections with the second mouse or rabbit primary antibody diluted in appropriate antibody diluent (See step 6). Substrate. Incubate sections in second, contrasting peroxidase substrate solution until optimal color develops.